Notiv is the meeting solution for professionals. Problem. The meetings with your client and your team leading up to and throughout a project are vital to its success. These conversations, whether on the phone, in-person or online, contain high quality insights that can help you make better decisions. Except, this information is rarely captured effectively, leading to inefficiencies and affecting outcomes. Solution. Notiv can help you deliver high calibre service affordably, while providing unique customer solutions. Whether you're a customer-facing freelancer, an engineering firm scoping and planning your new project, or an agency collaborating with a new client, Notiv can help you drive better outcomes without having to modify your workflow. With Notiv, you can fully engage with your client, secure in the knowledge that Notiv will capture your crucial insights. With Notiv, you can minimize risk of a breach by keeping things transparent. Act quickly to improve client outcomes. With a trustworthy record of events, you can ensure follow-up items are not lost and act on them quickly. Notiv works your way so you can easily update a client record, share specifc insights with your team or manage accounts efficiently. 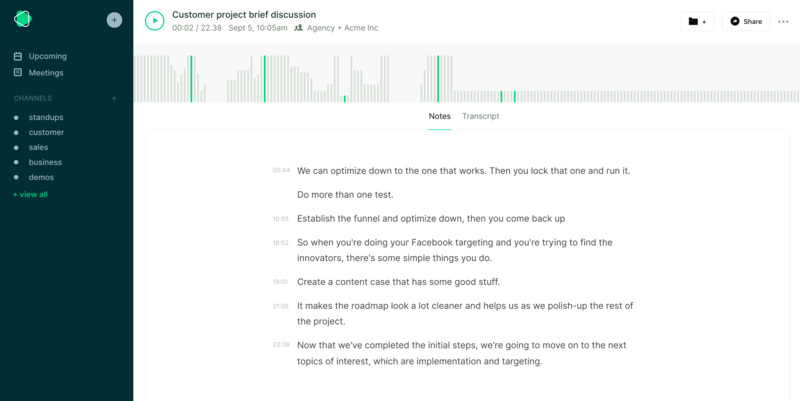 A collaborative way to record, revisit and share meeting insights and outcomes. More than 10 users? Contact us for a custom plan! Fully engage with your client and team. Let Notiv capture the magic and take the mundane out of meetings. Using A.I. to make our voices more powerful. Start a free trial today!